I.D.No. 4/3/2013-PMP4/67682 dated 15.07.2013 received from Prime Minister’s Office is forwarded herewith in original. Shri TKR Pillai General Secretary of the All India Association of Administrative Staff (NG) has raised the issue regarding revision of Grade Pay of LDCs and UDCs belonging to Non-CSCS. 2. As subject matter is relates to anomaly in the Grade Pay of LDC and UDC which is the subject matter of JCA Section, they are requested to take necessary action in the matter under intimation to this Division. DOP&T I.D. No. 25/2/2013-CS.II (B) Dated . 7.2013/13.08/2013. 1. First of all, kindly accept my profound regards and thanks for such a tremendous efforts for helpless clerical cadre of non-CSCS and I hope for early positive response of JCA Section. 2. I would like to also invite your kind attention on the discrimination facing by Clerical cadre of Border Road Org. As per Report of 6th CPC, the Commission has already recommended parity between similarly placed posts in headquarter organizations and Field Offices vide Chapter 3.1 of the Report and these recommendations are already made applicable to the Clerical Cadre of BRO/GREF vide Para 7.39.24 of the 6th CPC Report, which has been accepted/approved by the Govt of India during Aug 2008. Accordingly, Pay and grade pay are applicable to Assistants of this Department at par with Central Secretariat Services which are being revised by Government from time to time i.e. Grade pay Rs.4600/-pm as per DOPT OM No. 7/7/2008-CS.I(A) dated 21 Dec 2009 simultaneously without any discrimination between Clerical Cadre of Central Secretariat Services and Clerical Cadre of Field Offices. But above order is not made applicable to BRO clerks till date and BRO Asst are still getting GP Rs.4200/- only and no one is listening to us. Please seek justice for voiceless BRO clerks/ Asst. A positive news. Hope the Govt. think about hardworking LDCs & UDCs. Many many thanks for your kind efforts taken for the betterment of the Clerical Staff working in the Sub-ordinate Offices of the Govt. of India. The GOI's stepmother treatment towards the Clerical Staff working in the Sub-ordinate Offices must be stopped. There should be parity between the CSCS & the Clerical Staff working in the Sub-ordinate Offices of the Ministry. We have seen that the Govt. has wisely protected the CSCS by implementing NFSG Scheme & Cadre Restructure after the VIth CPC. But the same procedure has not been extended to Sub-ordinate services. Once again many many thanks Sir. At last you are going to success what you want to do for LDC & UDC who are actually indeed. An early reply is awaiting from JCA and all will be happy and come out from demoralise after a fruitful decision will be provided by the Govt. In view of the work and responsibilities, the Upgradation of Grade pay of LDC's and UDC's from 1900 and 2400 to 2400 and 2800 respectively are very much required. 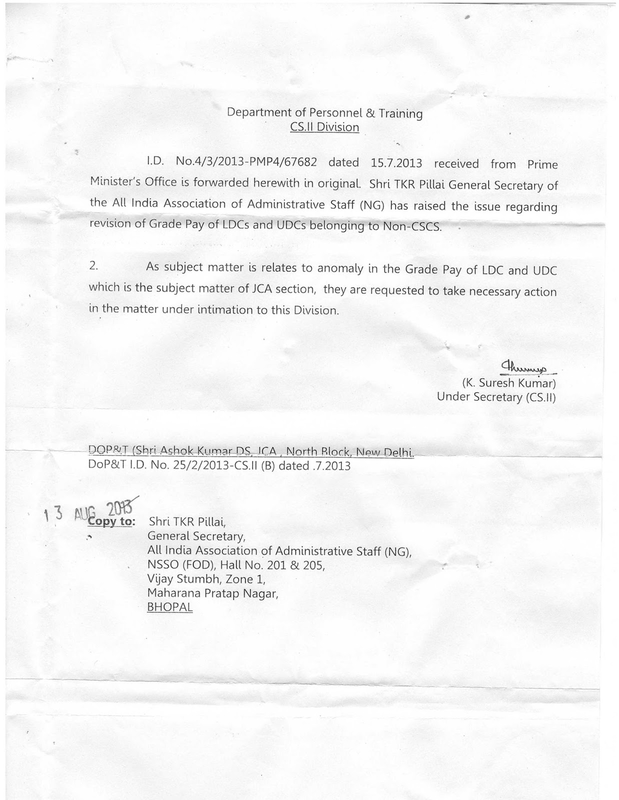 Whether letter sent to the DOPT regarding the upgradation of grade pay of LDC and UDC will be considered or not. We are poor LDC and UDC. No body has time to understand us. 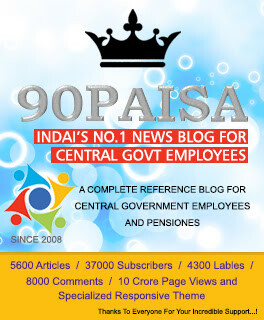 Everybody tries to have best of comforts, income and all other facilities to the higher class of employees. The lower levels of employees are doing hard works. Among them there will be graduates and postgraduates along with few numbers of SSLC or Plus Two or pree- degree qualified. But what ever may be the qualification of the higher class, whether SSLC or PDC or Plus Two , there is no problem. Every body will get enough. But in the case of LDC and UDC they have to suffer a lot- A lot of financial burden.Try to make awareness among the high powered DOPT about our problems. Grade Pay of LDC/UDC issue must be solved in the light of order of Hon'ble High Court/Chandigharh. SLP filed by Govt. of India has also been rejected by Supreme Court single bench division. (b) LDCs those who are appointed on or after 01 Sep 1984 are getting Grade Pay Rs.2800/- , if they are not promoted to Asst. They will retire with GP Rs.4200/- only. (c) In the above manner, LDCs those who are appointed after implementation of 6th CPC will retire with GP Rs.2800/- and PB1 only ( ie entry GP Rs.1900/-, GP on MACP1 Rs.2000/-, GP on MACP2 Rs.2400/- and GP on MACP3 Rs.2800/-), though the qualification for direct recruit has now been raised from 10th class to 12th class with computer knowledge. THIS ISSUE IS PENDING FOR A LONG. GOVERNMENT TO TAKE DECISION BEFORE THE ELECTION. sir, setting up of 7th cpc we want justice the grievances is all pay commissions have special protection given in CSCS cadre clericals, why not given in all the clerical cadre in non CSCS cadre. sir please we want justice in government 1) Cadre structure 2) same rules in CSCS cadre applicable in other non-CSCS cadre. are there any chances for upgradation of grade pay of ldc and udc...this topic is in discussion since last two years..but no decision taken yet...if its not taken befor election than it can be considerd that....its over...yaar ye ldc mehnat karte hai...1900 gp really makng mockery of ldc...govt if you want vote please consider it..
the condition of ldc is very pathetic... We should take pledge if congress govt do not do justice to us then, we will not going to vote for the congress party... 1900 gp too low.. When will the same be issued??????? Great thing that you have done sir . thanx TKR PILLAI SIR !! At least you understand our problem....if we do not get gp 1900 .. Then please make sure to the subordinate office...that ldc and udc are going to do that work which is allotted to them... And TKR PILLAI SIR! Uf ldc get 2400 grade pay then you will get huge parayers foem the children of ldcs...Almighty Allah may akways help you....and keep you happy always...love you TKR pillai sir!!!!! In view of the work and responsibilities, the Upgradation of Grade pay of AGRICULTURE FIELD ASSISTANT in ANDAMAN & NICOBAR ISLANDS from 1900 and 2400 to 2400 and 2800 respectively are very much required. Thanks for putting efforts for revision of grade pay to non CSCS clerical cadre staff and I hope you achieve the success soon. Sir, Hope DOPT should also consider promotional grade pay to all ACP/MACP cases wef 01-01-2006 to avoid fin losses suffered by number of poor employees like Steno Grd-III to Steno Gde-II. As per documents of DOPT the said file has sent to JCA section in mid of Aug. 2013, Kindly take the matter with this section and and we hope favorable decision in this matter will be relesed before the festival of Diwali for this cadre. Thanks Pillai Sir, whatever you have done for all poor clerical staff ldc/udc is commendable sir. But please let us know whether we will get this benefit of grade pay of Rs.2800 or not what is the government view on its implementation. Whether government is keen to implement this major issue of clerical staff. Please make the efforts the revise grade pay before "DIWALI' festival. As informed and published on the website, the Uttrakhand State Government has implemented the revised grade pay for their clerical staff i.e. Jr. Assistant / Sr. Assistant (LDC/UDC) as Rs.2400 & Rs.2800, but we the Central Government clerical staff are still waiting for the above revision of grade pay since long. But Sir, thanks for all the efforts you have made till now. We hope that your efforts will definitely come to the conclusion and all poor clerical staff will get their actual rights. It's a very happy news. But the same to be implemented as Stenographers Grade-III are appointed in the Grade Pay of Rs.2400/-. Why this cadre is completely ignored and the promotional channel to this cadre is not upto the mark. Moreover, I would like to say since ages the officials who are working in Central Secretariat Services (CSS)are given good treatment and they have been placed in the pre-revised pay scale of Rs.4500 as per 5th CPC. The duties and responsibilities of the Stenographers all over India is one and the same. Then Why this disparity is being shown since ages and nobody tried to resolve this problem?. Kindly look into the matter personally and hope to receive the orders favourably at the earliest. Kindly move this matter along with the LDC/UDC issue. Pillai Sir, Time has come to strongly raise this issue with DOPT to provide natural justice to the poor central govt employees cheated in the name of three MACP in place old two ACP. There should be no compromise in ACP/MACP cases less than promotional grade (benefit) to ensure right implementation of the govt intention, misinterepted and written by the people not aware about its adverse consequences suffered by all the employees irrespective of cadre. Matter may please be expedited with the issue of LDC/UDC. Regards. GOODLUCK TO ALL LDC AND UDC's !! THANK YOU VERY MUCH SIR, YOU ARE SO MAGNANIMOUS. NO DOUBT, YOU HAVE TAKEN A MAMMOTH TASK AND YOU'RE DOING IT IN A VERY PRUDENT WAY. OUR BEST WISHES FOR YOU SIR. MAY GOD BLESS YOU. Sir, There are no words to thank u for taking up this matter and getting a ray of hope. The efforts put by you for the welfare of the poor, voiceless clerks are commendable. Sir, recently Hon’ble High Court of Punjab and Haryana vide its Judgement on CWP No. 19387 of 2011 (O&M) dated 19.10.2011, and Hon’ble Principal CAT, Delhi vide OA-904/2012 have held that MACP is to be granted on promotional hierarchy and not on next higher Grade pay as per the 6th CPC recommendation. Further, the SLP filed by the Union of India against the Hon’ble Punjab and Haryana High court decision in the Hon’ble Supreme Court vide CC-7467/2013 was dismissed. we clerks are representing to our HQrs. in this regard, to extend the benefit to us. Further, I appeal all the clerks to represent their respective Head Offices in this regard. Meanwhile, I request you to take pain in representing on behalf of all clerks to DoPT to abide by the Hon'ble court decision and issue amendment orders at the earliest. Good news of clerical cadre. We are ready for any support required for said issue. Respected Pillai Sair thanks for all the efforts you have made to upgrade the grade pay of LDC / UDC. But sir this is very unfortunate that the various State Government has upgraded the grade pay and we the Central Government Employees (LDC/UDC) are still waiting for revision of grade pay i.e. 24oo & 2800 respectively. Anyway sir your valuable efforts are highly appreciated without you it is not possible sir. After the implementation of 6th pay commission if the person is appointed as LDC in Grade Pay of Rs.1900/- He will not go beyond the grade pay of Rs.2800/- during his/her entire servive. Earlier ACP was given on promotional basis after 12 and 24 years of service but as per 6th Pay commission the MACP is granted as per hierarchy of Grade pay which in no way is beneficial for the employees although same is being given after 10, 20 and 30 yrs. Sir, you have done a commendable job by raising the issues of LDCs and UDCs. Recently I have heard that Hon'ble Supreme Court/CAT have rejected the orders of the Govt. regarding the implementation of MACP on the basis of hierarchy of grade pay. I do'nt know why the central govt is still waiting for implementing these orders. Any way I again thank you very much for highlighting the issue. We are very much upset after seeing the latest of Shri K. Suresh Kumar, Under Secretary to Govt. of India in which it has been mentioned that the matter related to revision of Grade Pay of LDC / UDC of non CSCS category is not dealt by them and drected to take up the matter with the Ministry of Finance (Department of Expenditure) and the original letter has been returned to you by the DOPT for further action. We very much upset and can't understand that why the Central Government is not taking this issue of revision of Grade Pay of LDC / UDC when the State Government of Uttrakhand, Rajasthan, Punjab, Himachal Pradesh etc.etc. has already upgraded and implemented the revised Grade pay of LDC / UDC. Sir this is the time to move for Hon'ble Court otherwise we poor clerk will definitely feel depression. I M AN LDC WORKING IN A CENTRAL SECRETARIAT SUBORDINATE OFFICE IN DELHI FOR 23 YRS WITHOUT ANY PROMOTION. I'VE BEEN USED BY GOVT FOR 23 YRS. BUT I'VE TO REPORT TO THE NEW YOUNG DIRECT ENTRY IN GP 4200 WHO DOES KNOW RULES, WHO SUPPOSED TO CALL ME AUNCLE,SIR, AS PER MY AGE, EXPERIENCES. I M NO INFERIOR TO THIS FELLOW IN QUALIFICATION TOO.THIS IS VERY UNFORTUNATE.I DRAWS LESS PAY, DO MORE WORK, SPENT MORE YEARS IN GOVT SERVICE, BUT TO BE JUDGED BY A FELLOW WHOM I CAN CALL HER/HIM DAUGHTER/SON. VERY UNFORTUNATE!! !THIS IS QUESTION OF EQUALITY UN-EQUAL ENSHRINED IN INDIAN CONSTITUTION. THE SYSTEM NEED CHANGE.I PREPARED ALL NEEDED DRAFT,NOTE FOR ALL OFFICE ADMINISTRATIVE WORK SUCH GPF,CEA,FA,LTC,PENSION,OTA,ALL KIND OF LEAVE,DISCIPOLINARY, ETC,ETC. THE YOUNG SENIOR ONE SIMPLY CHECK UNABLE TO FIND OUT THE ERROR,INTERPRETATION OF RULES,SOMETIMES POINTING OUT MINOR ERROR LIKE SPELLING, COMMA, ETC. HA HA HA! !AND THEY R GETTING 4200 GP. I GET ONLY 2000 GP.I FEELS MY MORAL DOWN TO GRAVE,TOUCHED TO BOTTOM ROCK OF LOW. OOOPH!! LORD MY GOD AND MIGHTY AGENTS OF CHANGE- LEADERS OF INDIA PLEASE AWAKE AND DO SOMETHING TO BRING EQUAL PAY FOR EQUAL WORK!!! LET THE FEUDAL STYLE OF ADMINISTRATION END.MAY HIS KINGDOM COMES! AMEN! and we got fulfill joy in our future development. What happened friends there is no comments in this post now days. I think all clerical staff is now thinking that they will not get this upgradation of Grade Pay of Rs.2400 & 2800 because this issue is long pending and in the mean time the 7th pay commission has also been setup. But friends please don't stop your comments in this blog. Keep writing your valuable comments and ideas to support Mr. T.K. R. Pillai Sir who have done a commendable efforts for the upgradation of LDC / UDC. Please please give your valuable comments and also reply my above words. No doubt you are trying your best for upgradation of pay of LDC/UDC but govt. is trying to linger it knowingly. On one hand the same LDC and UDC of CSS cadre are being benefitted by issuing several orders by DOPT and recent is the order for UDC(NFG) but the LDC/UDC of subordinate offices of central govt. departments are deprived of the benefits although worked hard in smooth functioning in the administration. In fact the discriminatory attitude of UPA govt. has compelled to lead us miserable life. To achieve our aim we must unite first and start agitation if not being settled and also teach lesion to the UPA govt. in upcoming lok sabha elections. Thanks for your cooperation in the matter of Gd Pay for LDC & UDC. LDCs / UDCs ARE STILL WAITING FOR THE BRIGHTNESS. HOW LONG WILL IT TAKE TO COMPLETE THE TASK, SIR? IT SHOULD BE COMPLETED BEFORE THE ELECTION, IF THE FLOOD COMES, THE SAME WILL BE TOTALLY LOST. I think we should leave this matter of upgradation of grade pay of LDC / UDC as this is long pending issue. Government is not interested to increase the grade pay of LDC / UDC. So think for next pay commission and forget on god. I think we all LDC's & UDC's should move to court otherwise this government will not give us our right and again we will be left un-noticed. Sir, kindly take necessary action strictly before election as after elections scenario will be different and again we will be looser. We are with you. I am working as LDC in MCD. I am drawing grade pay 1900/- but one peon working in my office is drawing grage pay 2400/- . Please upgrade the grade pay of LDC and UDC. Sir i am an udc I think above 8700 GP post holders are need not required any hike in 7th cpc because,they are not handling any type of hard work in office, and their salary already in higher side,they are increasing their savings only,so only LDC,UDC, &ASSISTANT are requried some hike in this 7th CPC,otherwise Govt will done another mistaken,as like as last CPC .Higher GP holders are only taking rest doing nothing in office except signature because they have already saved sufficient money on their account.So kindly take a chance to lower Gp holders at least live smoothly in this type of higher market situation. Pillai Sir! Appreciating your endeavours, it is to inform that one of the sister organisations of Central Secretariat Service(CSS); AFHQ Cadre at Ministry of Defence, (consisting of 3000 LDCs/UDCs & ors...) has already submitted a proposal in 2011 for up-gradation of Grade Pay of LDC & UDC in Rs. 2400/- and Rs. 2800/- respectively. The proposal was duly strongly recommended by the JS(Trg) &CAO and duly approved by the Finance Division of Ministry of Defence, taking action on the representation submitted by Shri Din Dayal Shukla, General Secretary & then JCM Member of the Office Council. "if LDC/UDC of Ministry of Defence is allowed to grant grade pay of 2400/- & 2800/ respectively , there may be a repercussion throughout the country among all the common category employees." My friends, it is not AFHQ Cadre, but it is the CSCS cadre which has not been raising the issue for a long time,in spite of our efforts. It is our observation that our demand may find rainbow feather, if Central Secretariat Clerical Service (CSCS) also joins our hands or raise the issue. Hope for the JCA section to take the matter seriously and release the orders. Thanks to Mr Pillai for taking up the matter. We LDC/UDC are the least paid employees. You take special interest on LDC's and UDC's problem. Really that was very much appreciated one. We are very grateful to your sir. you are fighting on behalf of all LDC's and UDC's. It is really a good news to all LDC/UDC working in all Non-Secretarial sub-ordinate offices of concerned Ministries. Further, after getting the demand from the DoPt is only real victory for our Cadre. So, such time we will wait and will get positive result in short while and that moment is real victory for us.